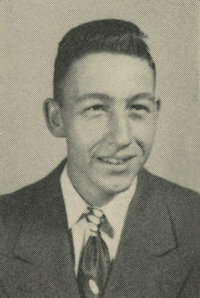 Obituary – DeBord, Vernon King « Perry High School Alumni Association, Inc.
﻿Football 47-50, Class Secretary 48-49, Student Council 49-50, F.F.A. 47-51, F.F.A. Reporter 49-50, F. F. A. Vice-President 50-51, Perryscope Staff 50-51. Vernon “V.K.” DeBord, 71, born Aug. 17, 1933 in Perry, OK and died March 9, 2005 in Oklahoma City, OK.
V.K. was married to Elizabeth Ann Martin and later married Billie Pierce. He retired from Estes Chemical in 1991. V.K. was a member of Hillcrest Christian Church. He enjoyed reading, traveling, raising cattle and farming, but he loved going to church. V.K. was preceded in death by his parents; brother, Charlie; aunt, Viola DeBord. He is survived by his wife of 21 years, Billie; sons, Dale and Teresa DeBord, David and Kim DeBord, Mike and Sandy Pierce, Patrick Pierce; 14 grandchildren; 2 great grandchildren; special nephew, Edwin (Preach) DeBord; and many other relatives and friends. Services will be held at 10:00 AM Saturday at Vondel Smith South Colonial Chapel. In lieu of flowers, memorials may be made to Hillcrest Christian Church, 1501 SW 59th St., Oklahoma City, OK 73119.